Now for the technical stuff. The differences between custard and regular ice cream are several. Most significantly, custard is higher in fat. This gives it a richer, creamier, smoother mouthfeel. But it also requires that it be served at a higher temperature and thus at a softer texture. Custard isn't so much scooped as smushed into a cone or cup. It is soft like soft-serve, but the two are worlds apart. 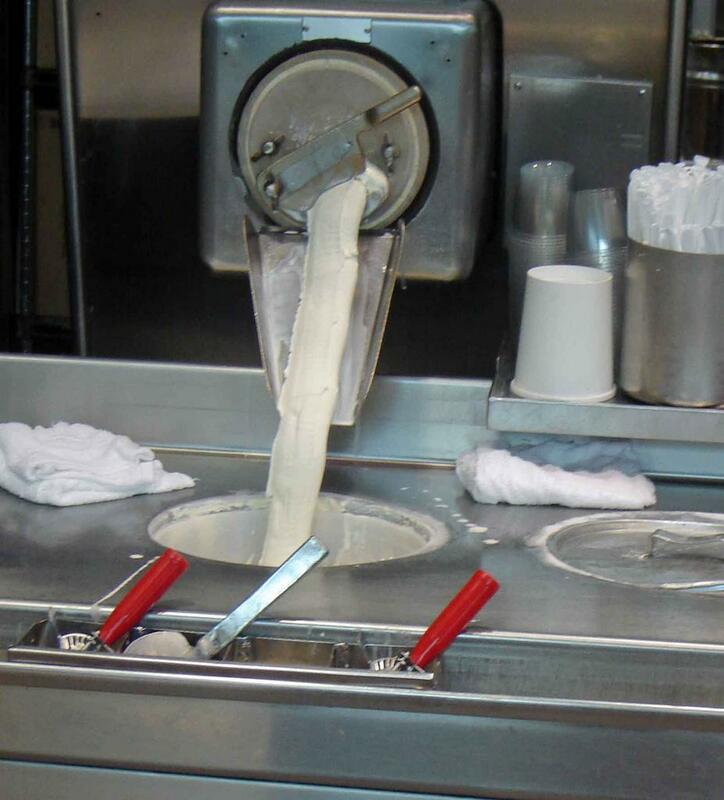 Here you see the vanilla oozing out of the machine and into a tub ready for serving. Unlike soft-serve custard tastes like dairy, not like artificial ingredients or shortening, and also unlike soft-serve custard is dense rather than airy. Because it has to be served soft, custard doesn't keep well in the freezer. This might sound like an inconvenience but it's actually a kind of blessing. It demands that people go out for custard and eat it at a custard stand instead of their own kitchens. And the social dimension of eating custard is one of my favorite things about it. I always know that the other people at Kopp's are having as much delicious fun as I am. You can take a pint or quart of custard home or order it online to be shipped in dry ice, but it just won't be the same after having been frozen solid. It's best eaten right there at the custard stand. 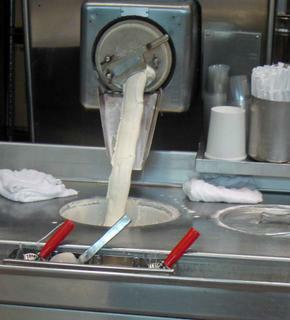 Kopp's has daily special flavors in addition to the standard vanilla and chocolate. They print monthly schedules that you can keep on your fridge and they have a flavor hotline you can call if you lose your schedule. 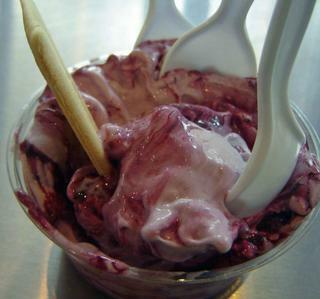 Today's flavor was black raspberry. Since it was close to dinnertime, the three of us shared this. The little guy got purple custard all over his face and shirt, and he was very, very happy. How did it taste? Like sweet fresh fruit, like the last gasp of summer. Hey, MZN--how about a Carnival of the Badger submission? Say, for example, this post? I've been to Kopp's before while traveling through WI when we lived in MN. Its excellent! Didn't try the Custard, but the burgers, chicken and atmosphere stinks! I moved from the Milwaukee area three years ago and I really miss the Kopps Custard. When visiting the arrival time at General Mitchell has to during Kopps hours. Can't wait for the creamest, most flavorful custard on the face of this earth. It's a stop you have to make when in Milwaukee any time of the year. ohhhhhh I stumbled upon this page and just about cried! I moved with my family from Wisconsin in 2001 and let me tell you!!! I MISS KOPPS! It was a sacred family ritual like event every time we ordered from there! I remember the last time I was back in WI in 2005... My ex thought my extended family was CRAZY to stop there EVERY day of our vacation to visit my family in WI. BEST everything! Thanks for putting a smile on my face! Now? I'm in Florida, no custard or burgers, onion rings or fries to compare to those pieces of heaven!